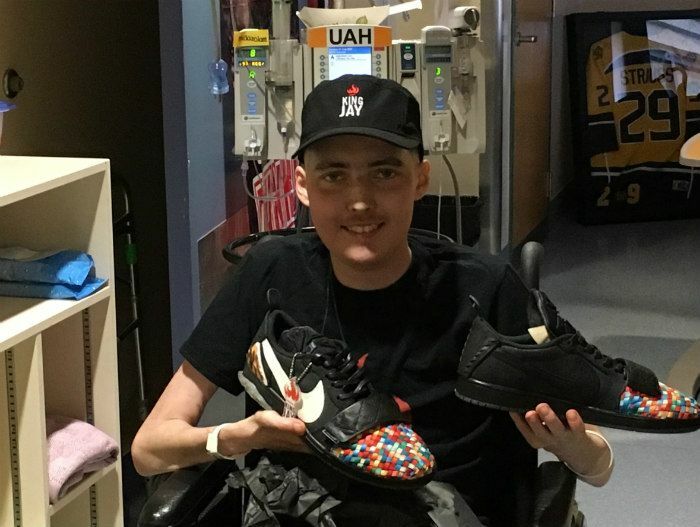 When the 18-year-old Edmonton high school athlete was diagnosed with stage 4 Rhabdomyosarcoma, Strauss had one wish: designing his own pair of custom Nike sneakers. The Children’s Wish Foundation of Canada rushed to grant his wish this fall as Strauss’ health began to deteriorate. The all-Canadian wish-granting organization, which operates in every province and territory across the country, hooked up with renowned American shoe designers Dead Dilly and Proof Culture to bring his shoe designs come to life. 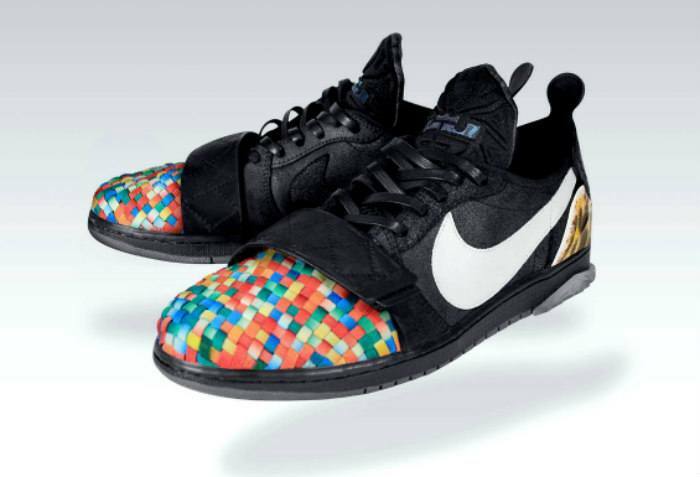 Strauss’ shoes included materials from seven different Nike shoes, a custom paint job, a custom hang tag, Italian leather laces, and a custom wooden box. After tireless work cutting and hand-sewing the one-of-a-kind sneakers, the designers then hand-delivered the shoes to Strauss in the hospital, where he was overjoyed that not only was he getting one shoe, he was getting a complete pair! The impact of his wish was so powerful that Strauss lived months longer than expected while waiting for his wish to be completed. When he finally received the shoes in October, he laced them up and walked the hospital hallway for the first time in weeks. Not only did he have fire on his feet when he took those laborious steps, Strauss slept in the shoes as well. Sadly, a few weeks after receiving his wish, he passed away, but it was the fire in his fight that inspired King Jay – an apparel line created by Children’s Wish in Strauss’ memory. 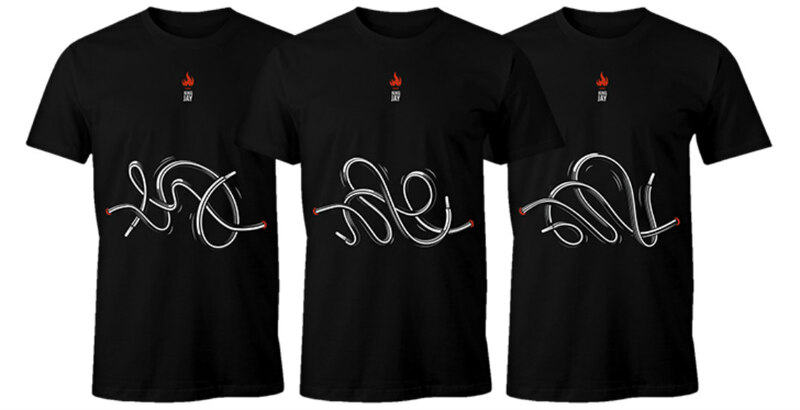 The limited-edition clothing was designed to unite us all with each piece emblazoned with one of four interconnected shoelace patterns. With all proceeds going to Children’s Wish, King Jay will help grant more wishes for more courageous kids. Strauss’ wish was a unique and important one for the foundation. After over 30 years in operation, this was the 25,000th wish granted by Children’s Wish. Each and every wish is fully funded by donors and the foundation receives no government support. On average, a wish costs roughly $10,000 to fulfill and can include a trip, experience, or item. By and large, the most popular wish requests are trips to Disney theme parks, but Strauss’ wish was one of the more unique in Children’s Wish history. Children’s Wish is hoping King Jay apparel will help carry Strauss’ wish forward for other children living with a serious illness. 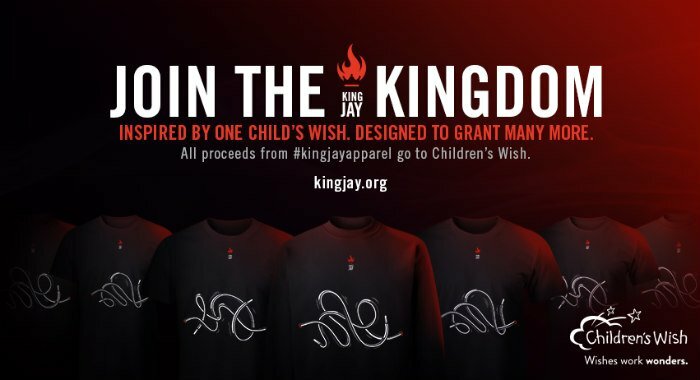 “We’re asking people to join the kingdom by purchasing a piece of King Jay apparel and help us grant the next 25,000 wishes for Canadian children diagnosed with a life-threatening illness like Jayden,” Goulin added. All of the limited edition King Jay apparel, including sweaters, hoodies, t-shirts, and baby onesies, are available online at kingjay.org. And they make the perfect holiday gifts, all for a great cause.